1-Click Phone to Phone Transfer, Copy and Backup contacts, messages, call logs, calendar, photos, music, video and apps between Android, iPhone/iPad/iPod, BlackBerry and Windows Phone. Transfer, Backup, Copy and Restore over all of your data – including contacts, text messages, call logs, photos, music, videos and apps – with no risk or loss of quality between iPhone/iPad/iPod, Android, BlackBerry and Windows Phone on Mac. Provide efficient tools including file transfer, cleaning and optimization that will keep your iPhone clean and healthy. 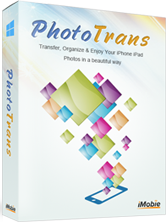 Transfer files like apps, photos, music, contacts etc. from your iOS device to a Mac computer and iTunes, browse your iTunes and iCloud backups of your iPhone like a normal USB flash drive. iPad/iPhone/iPod to Computer Transfer tool for users to back up and manage everything from any iDevices on a PC leisurely. Efficient tool to make a copy of various files from iOS Devices to computer. Transfer iPad/iPhone/iPod data to Mac within a few clicks, including video, audio, book, playlist, voice memo, podcast, TV show, etc. Support two different modes for viewing. All-in-one Tool to Fix all iOS Problems and Care for iPhone, iPad and iPod. You can use this tool to speed up iPhone, remove in-app ads on your devices, unlocked a locked iPhone, backup iDevices, etc. Transfer and Organize iPhone iPad iPod touch photos to & from computer, organize albums without iTunes and enjoy the wonderful pictures in a slideshow. 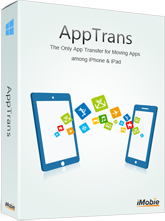 AppTrans (for PC and Mac) is fire-new iPhone iPad App Transfer made to transfer Apps among iPhone, iPad and iPod touch without iTunes and iCloud. 3 App Transfer Modes help to keep all game records and personal settings. All-in-One iDevice Backup & Transfer Software (for PC and Mac). It enables to backup, transfer and manage almost all iOS personal info and media files to PC / Mac, to iTunes, iCloud, or to iPhone, iPad, and iPod.